With the constant push today toward "Green Computing", virtualization is becoming extremely popular. By using Windows Hyper-V, your company could run multiple servers on one piece of hardware, completely eliminating the need for more power consumption, more hardware to purchase, and software conflicts between two or more programs that should not be run on the same box. If the hardware is available, there's nothing stopping you from hosting a server instance for each application you need hosted. However, this does place all your eggs in one basket, making it imperative that you have a solid working backup solution in place. If you are not properly prepared, and the host server goes down, you lose much more than just one server. Depending on the type information you're hosting on your Hyper-V virtual machines, the traditional backup approaches may be appropriate. If the VM is only hosting file shares for things like drawings, documents, forms, pictures, or other such static information, then perhaps a simple Robocopy script that makes a second copy of the data to another device would be appropriate. Windows Server Backup provides a basic backup solution, and is very popular and effective especially for smaller businesses looking to save money. It comes with Windows Server 2008, and is particularly easy to use, so you don't need a network administrator to perform backups and restores. You can Windows Server Backup to back up Hyper V virtual machines, but you have to do a little work first. The first thing you have to do is register the Microsoft Hyper-V VSS writer with Windows Server Backup. This can be done in one of two ways. You can do things the old fashioned "hands on" way, and follow the steps in this Microsoft knowledge base article. Microsoft has created a "Fix it for me" program file that you can download here or by going to the Microsoft knowledge base article linked above, and finding the download link there. Once that operation is complete, you can create a backup within the host operating system using Windows Server Backup. Be sure to back up not only the VHD image files, but also any configuration files that the image requires to run. They aren't always on the same partition. If you're not certain where all the files you need to back up are located, consult the network administrator or the person who created the Virtual Machine. Also, be aware that Windows Server Backup does not support backing up Hyper-V virtual machines on Cluster Shared Volumes (CSV volumes). Sources for this information include Microsoft's TechNet Wiki, and Microsoft's support knowledge base. 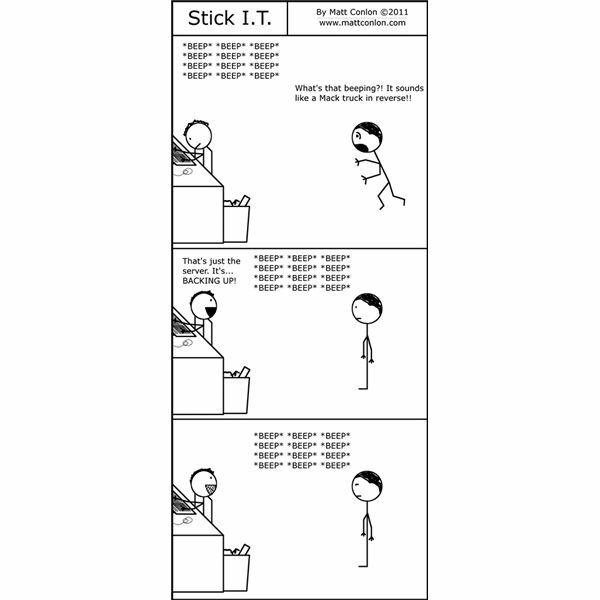 The web comic "Stick I.T." is written and drawn by this author, Matt Conlon.